Once your furnace gets to be around 10-15 years old, it will probably need some type of Gladewater furnace repair. AC Contractors provides reliable heating repair services for residential homeowners. In some cases, a repair is all that is needed to get things running efficiently again. In other cases, it’s more cost-effective to get a Gladewater furnace replacement. Our trusted technicians will go over your options and help you choose the right fit for your comfort needs and budget. We know that choosing a company for Gladewater heating repair is a big decision. You’ll be inviting people into your home, and you need to feel comfortable with them. You also need to trust the feedback you’re getting. No one wants to be pressured into buying a new furnace when they don’t need one. Fortunately, you can trust AC Contractors for honest, dependable Goldwater furnace repair. Here’s why. We have quality employees. AC Contractors is the #1 AC and heating company in East Texas. We hold this status largely because of our trained, experienced technicians. All techs are background checked and drug screened as well. Quality employees leads to quality results. We have better guarantees. All Gladewater heating repair services come with our “fixed right or it’s free” guarantee. If, after making all necessary repairs, your furnace still isn’t working, the repair is free. We have a positive track record. 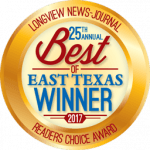 Homeowners all over East Texas trust us for furnace replacement in Gladewater TX. We have solid reviews and an A+ rating with the BBB. Locals love us! We take a holistic approach. Our technicians look beyond the furnace repair in Gladewater TX. We want to make sure that we are meeting ALL of your indoor comfort needs, and this starts with better indoor air quality. To schedule a FREE estimate for Gladewater furnace repair, call AC Contractors. We look forward to hearing from you and addressing your comfort needs.